HIPAA | 802 Secure, Inc. 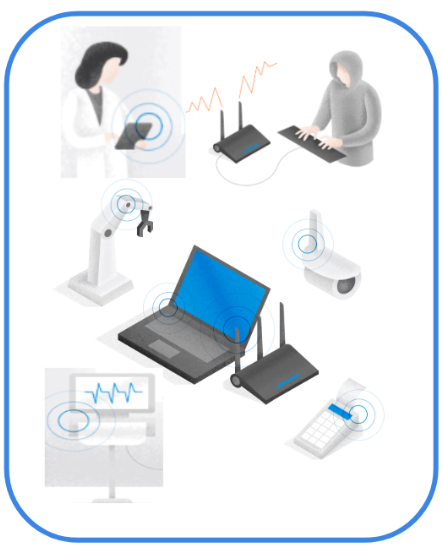 The increase of IoT devices poses a new, modern challenge to the healthcare industry as 95% of IoT devices are wirelessly enabled. From medical devices like heart monitors, x-ray machines, MRI/fMRI machines, and infusion pumps, the proliferation of these IoT devices have expanded the attack surface for data breaches and security hacks. In fact, according to Gartner, 25% of healthcare attacks/data breaches will originate from IoT devices by 2020. Perhaps even more frightening are the implications of malicious actors gaining control of patient health and safety devices, which could ultimately threaten the life of a patient.